This month we’re very happy to bring you Joshua Sedelmeyer, an Endicott Talent from behind the bar, on the stage, behind the scenes and in the community. Besides that he’s just an all around great guy! Joshua graduated from Seton Catholic Central and then Ithaca College with a BFA. Since graduation he’s wasted little time. He’s a professional actor performing at Binghamton’s Know and Ithaca Theaters. He teaches theater at JCC, and stage combat at Vestal High. Earlier he was very involved with the Cider Mill Playhouse creating programs like Fresh Cider which focused on entertainment and education for families. He’s even hosted workshops and helped produce shows there. He’s hosted concerts for the Binghamton Philharmonic like “Star Wars” and “The Magical Music of Harry Potter”. And of course, as the title preempts, he’s one of the great bartenders at Antonio’s Bar & Trattoria. Joshua has a list a mile long of why he loves bartending at Antonio’s starting with the guests he sees everyday and the people he works with. This is his neighborhood and he has a lot of pride in this corner restaurant of Endicott’s Little Italy. It’s a place where there’s always celebrations, events, incredible food and of course amazing signature drinks like the Bloody Marys shown here. Thank you Joshua for all you do to make this a great place to live! We each have our own taste for Bloody Marys from mild to spicy. 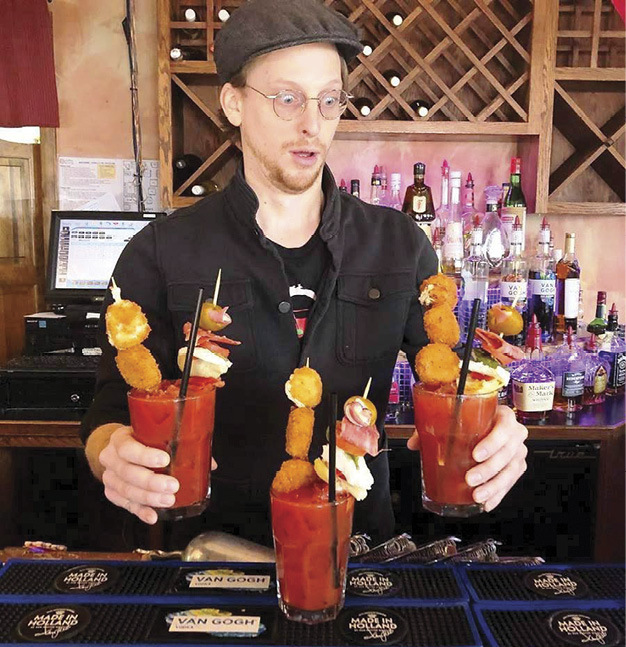 Have some fun at home making your perfect Bloody Mary Mix and to recreate a little of Antonio’s masterpiece try it with Van Gogh Vodka topped with Antipasto Skewer, Risotto Cakes and a Goat Cheese Croquette for that incredible presentation.